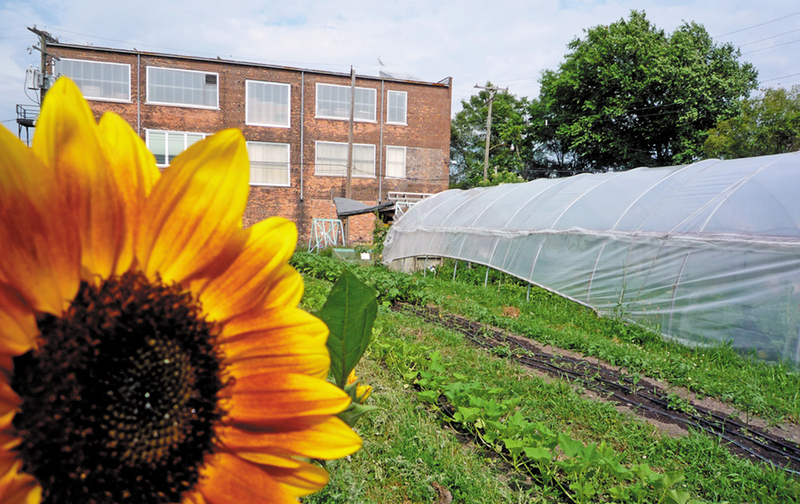 A sunflower grows in Detroit at the Earthworks Urban Farm. It’s become all-too-fashionable in recent years to say that American politics is “broken,” to throw one’s hands up in horror and mutter about stalemate, paralysis, the outsize influence of Big Money and all the other demons of Washington, DC. And, federally, that may well be the case. Yet, at the city level, politics is a whole different ballgame, with a generation of progressive mayors pushing big-picture reforms on a scale not seen in years. As a result, many regions are being remade for the better around creative approaches to the environment, mixed-income housing, transport, employment, schooling, health and food. Seattle has garnered international attention with its move to increase the citywide minimum wage to $15 an hour, achieved after socialist Councilwoman Kshama Sawant pushed the issue to the fore during her 2013 campaign, and after her victory convinced Mayor Ed Murray of the electoral benefits of embracing the higher wage. In its wake, San Diego, San Francisco and many other cities have moved toward far higher minimum wages than those guaranteed both federally and at the state level. Portland, Oregon, meanwhile, has long been renowned for pioneering investments in public transport, creating near-total access to buses and light rail, and helping secure its place as one of the country’s most livable cities. And in New York, Mayor Bill de Blasio has pioneered a universal prekindergarten program, offering a preschool place to any child whose parents want it. In September 2014, more than 50,000 kids began attending city-run and city-funded prekindergartens, and the number is expected to rise next year to more than 70,000. Many of America’s other large cities, including Seattle, Denver, Boston, San Francisco, Los Angeles, Chicago and DC, are also moving toward universal preschool access. But the city-level changes in America go far beyond these headline-generating moves. Often out of the public spotlight, hundreds, if not thousands, of creative programs and policy experiments are being pushed in cities from Honolulu to Miami, Chicago to Houston. Ideas range from the distribution of free laptops to kids in poor neighborhoods, as in parts of Miami, to innovative public-health strategies to contain the spread of hepatitis and HIV among intravenous drug users in Albuquerque, to Cleveland’s well-publicized support for the worker-owned Evergreen Cooperative. Long considered a near-apocalyptic example of what happens when a big city hits the skids and goes into a steep population decline, Detroit has become home to a vast network of urban farms and gardens. Out of dystopia is emerging, in some neighborhoods, a strangely utopian social experiment. The transformation of Detroit’s abandoned lots into sustainable green spaces started as a somewhat inchoate phenomenon, the farms begun by desperate residents simply trying to survive. But in recent years, urban farming has coalesced into a more organized movement with a fair degree of political clout, the farmers represented by an array of organizations. The Garden Resource Program, which supplies information as well as seeds and vegetable transplants to residents who want to start farming, supports 1,400 farms and gardens in Detroit alone, growing everything from tomatoes to apples. Some even host cattle and goats. While the city administration was initially hostile, it has recently embraced this trend, realizing that the farms may be Detroit’s last, best chance to convert abandoned lots back into something productive. A staggering 200,000 parcels of land were vacant in the city and its surrounding area in 2012. A year later, the City Council passed a zoning ordinance allowing agriculture within the city limits. Farmers’ markets are now emerging, and restaurants have started selling meals cooked with city-grown produce. Like many other old East Coast and Rust Belt cities, Philadelphia has long been pocked by vast tracts of blight. The best estimates place the number of vacant or abandoned lots between 30,000 and 40,000. These buildings have, historically, ended up owned by numerous different city agencies, with an utter lack of coordination characterizing the process. The term “land bank” can make one’s eyes glaze over. But, in fact, the land bank movement represents an important effort to tackle both urban blight and the ongoing impact of the foreclosure epidemic. And it has been embraced by New York State, Michigan and a number of other locales. Although the Big Easy is one of America’s great culinary centers, diabetes and obesity have long plagued the city and, in particular, its poor residents. Many parts of town, especially after Hurricane Katrina wiped out local businesses, are food deserts, lacking ready access to healthy foods. All of this is part of a broader strategy to prioritize social impact investments in post-Katrina New Orleans and to convert disused warehouses, schools and other large spaces into hubs for economic activity in poor neighborhoods. Will it work? The Big Easy still has a long way to go. But if it can find a way to tackle the obesity and diabetes epidemics that afflict its impoverished communities, that will be its own kind of triumph. With the same goals in mind, Los Angeles, San Francisco and other California metropolises have chosen a different strategy to get healthy food onto the plates of low-income residents. The California Market Match Consortium’s Fresh Approach programs take the economic sting out of buying fruits and vegetables by providing poor Californians with $5 worth of free produce every time they spend $10 of CalFresh benefits (the state’s version of food stamps) at a participating farmers’ market. In 2013, CMMC released a report showing that, since the program’s inception in 2009, the use of CalFresh benefits at farmers’ markets had grown by 171 percent. In other words, poor Californians are getting healthier food thanks to this effort. The Lone Star State’s progressive capital has bucked the car-centric, economically segregated design of other big Texas cities, promoting affordable mixed-income housing development anchored by easy access to public-transit systems. And, since Austin is now the second-fastest-growing city in the United States, that’s no mean achievement. Under SMART (which stands for Safe. Mixed income. Accessible. Reasonably priced. Transit oriented), the more units a developer sells or rents at prices affordable to a family earning less than 80 percent of the city’s median income, the greater the percentage of fee waivers the city gives. Once 40 percent of units in a given development are “affordable,” the city waives all of the developer’s fees. What makes Austin’s program more interesting, however, is that it’s not just about affordability; it’s also about access. Built into the SMART codes are requirements that SMART-qualified housing be within a half-mile of a bus route. That’s a slightly less stringent requirement than the program initially had, but still one that keeps Austin a public transit–centered city as it expands. Austin isn’t alone in pushing for creative, mixed-income solutions to the housing crunch. In Atlanta, the area of East Lake, once home to one of the city’s largest public-housing tracts, has been redeveloped by a group called Purpose Built Communities (PBC). With a mixture of public and private funding, large swaths of desperately poor and dangerous public-housing blocks—the biggest contiguous swath of public housing in the South—have been replaced by low-rise, mixed-income neighborhoods, along with new schools and businesses. The East Lake changes have been successful in large part because they have taken place with the support and engagement of local residents. How was that support won? By the city, under then-mayor Shirley Franklin, committing not to push the existing residents out of the neighborhood—as has happened elsewhere when public-housing tower blocks have been replaced by mixed-income, low-rise dwellings—and by a participatory process that brought local residents to the table when changes were broached. Franklin has since become president of PBC. In January 2014, Salt Lake City, the capital of Utah—a state that is hardly known for its progressive vision—made history by becoming the second city in the country to end homelessness among military veterans. (Phoenix was the first.) How did Salt Lake City do it? While other urban hubs were busy passing laws to arrest people for panhandling or sleeping in public, Salt Lake City opted for the more humane, and ultimately more practical, approach of providing homes for its homeless vets. Inspired by the “housing first” philosophy, the program aggressively links homeless men and women with housing—by finding and building apartments—while also providing access to counseling and other support services. Salt Lake City’s experiment is part of a still more ambitious statewide housing first program, which is working to provide permanent homes to 2,000 chronically homeless residents, many in the urban environs of Salt Lake City. Somewhat counterintuitively, Utah has found that providing homes to the homeless, and then helping with mental health treatment and job searches, comes in many thousands of dollars cheaper than leaving homeless men and women to cycle in and out of jails, prisons, hospitals and shelters. According to the best estimates, the cost of housing a homeless person averages about $12,000 a year, whereas the cost of leaving a person to the streets can climb to more than $20,000 a year. Back in the mid-1980s, progressive politicians in Burlington, Vermont, began fearing that the influx of moneyed homeowners from the big East Coast cities was making their town unaffordable to local residents. So they decided to act: they formed a Community and Economic Development Office, which then put up $200,000 in seed funds for a city land trust that began buying up local properties, selling them at subsidized rates and reinvesting profits in more properties. The intent? To build up, over a period of decades, a large stock of homes rented or owned by low- and moderate-income locals at below-market rates, with the land trust putting up a percentage of the initial purchase price in exchange for a share in the profits when the owner eventually sells the home. To help maintain these homes, the housing trust also provides residents with low-cost loans for repairs and for environmental upgrades. And, to ensure that the homes stay affordable from one owner to the next, owners have to sell at a designated price: what they paid originally, plus 25 percent of the appreciation in value that the house would have had on the open market. In other words, say a house was bought originally for $100,000, but is now worth $200,000. When the owner sells back to the housing trust, the trust only has to pay $125,000. Think of it as akin to rent stabilization, but for homeownership. Roughly 2,000 individuals and families are now in the city’s Housing Trust homes. When the word “environmental” is bandied about, one doesn’t immediately think “Chicago.” Yet when it comes to green roofs, the Windy City has led the way for more than a decade (though in recent years its dominance has been challenged by New York, Portland and Washington, DC). Its transformation began more than fifteen years ago, after Richard Daley, who was mayor, visited Europe in the wake of a heat wave in Chicago that had killed upward of 700 people. There he saw innovative urban environmental planning, including the widespread use of green roofs, and came back inspired to emulate some of the design ideas pioneered in Copenhagen and various German cities. His first big move was to transform City Hall’s roof in 2001 into a garden made up of tens of thousands of plants. At the same time, the city enacted incentives for developers, from speeding the permit process to offering grants, and allowed green-roofed buildings to have additional floor space. Nine years ago, Boulder, Colorado, voters passed the country’s first carbon tax, electing to charge themselves roughly $7 per metric ton. The tax covered all electricity usage in the city, although homeowners who use alternative energy sources, such as wind power, qualify for rebates. In 2009, the city increased the tax rate another few dollars per ton. While the program hasn’t been the financial windfall some predicted, generating less than a third of the anticipated revenue, it has still cut emissions by well over 100,000 metric tons per year. And the money raised has been plowed back into energy-efficiency investments. Boulder’s tax has been recognized internationally by climate activists, and modified versions of the program have been implemented in other US cities. The program remains popular: in 2012, 82 percent of residents voted to keep the carbon tax for five more years. In a uniquely Boulder-esque twist, the city recently responded to Colorado’s legalization of marijuana by imposing an extra carbon tax on industrial-scale pot producers.